The Bermuda Economic Development Corporation [BEDC] has announced that this season’s Harbour Nights will be extended to Court Street with the new Uptown Harbour Nights community event, operating from Wednesday, June 15 to Wednesday, August 31. The BEDC will be hosting two Lunchtime Information Sessions for interested vendors on Wednesday, March 16 and Wednesday, March 23 at 12.00pm at its main office at 48 Church Street in Hamilton. A spokesperson said, “BEDC has been working with businesses, residents, and community stakeholders in North East Hamilton for years in a collective effort to rejuvenate this culturally and historically rich and diverse corner of the City of Hamilton. “The designation of North East Hamilton as an Economic Empowerment Zone in 2007 is just one result of the hard work and progress that has taken place by the stakeholders in the community. Economic Development Officer for N.E. Hamilton, Roxanne Christopher said, “This is an exciting time for NE Hamilton. 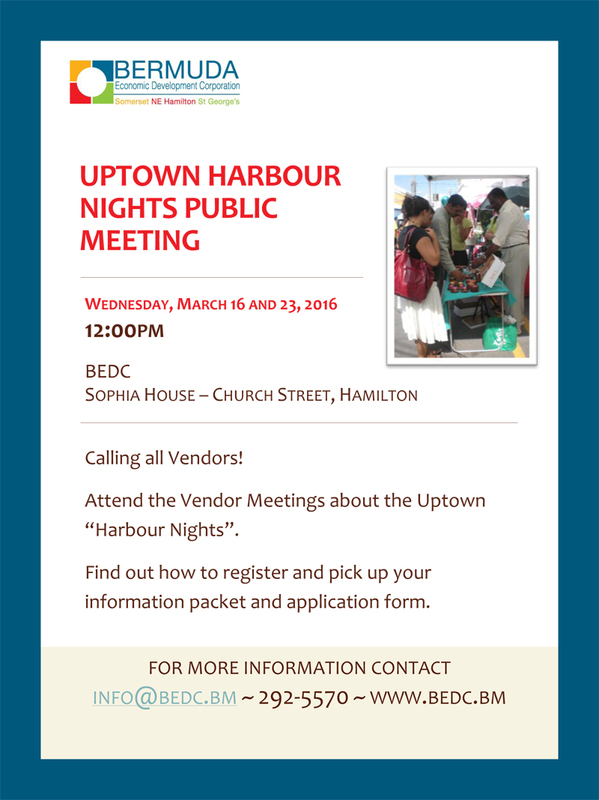 Working with our Vendors, BEDC is committed to ensuring the success of Uptown Harbour Nights. To register, email info@bedc.bm or call 292-5570. Further information can be found on the BEDC website.